Bored of drab MPVs? 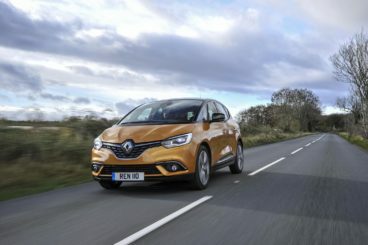 The new Renault Scenic Estate is another fab-looking, useful family car from the French brand that’s destined to be another hit. It’s affordable to run, practical, and has a sprinkling of style that will make it attractive to buyers. Now entering its fourth generation, it’s got all the attributes needed to be a success in this market. Large, meaty 20” alloys are standard on all models, its family-friendly face has never looked friendlier, and its diesel engine returns over the 80mpg economy. OSV takes a closer look at what it’s all about with our 2017 Renault Scenic Estate review. Renault has been working hard to shore up the handling on all its models recently, and they’ve done the same with the Scenic. It was a bit rusty on the handling front in the past, but things are much improved this time around. It doesn’t weigh any less, which means it’s still fairly heavyset. But it’s noticeably more agile and composed. Moreover, its steering has been tweaked so that it’s more responsive and accurate. Body lean isn’t too bad at all either, with the modified suspension keeping things in check. That said, the faster you approach bends, the more unsettled the car will feel. It just doesn’t have the same level of road manners as, say, the Renault Megane. In terms of the engines, the diesels suit the Renault Scenic’s character the best. A refined and smooth 1.5-litre diesel might be entry level, but it’s a decent bet. It needs you to work it hard, while its 108bhp power plant will feel underwhelmed at times, but a 0-62 time of 12.3 seconds is respectable. Rounding off the diesel range is a 1.6-litre dCi unit that’s available with either 130bhp or 160bhp. The smaller of the two has the best mix of performance and economy, but unlike the other diesels it’s strictly manual. The petrol engines aren’t particularly nippy. There is just a 1.2-litre TCe engine available, but it comes in two separate power guises – 115 and 130bhp. The latter offers a good amount of power, and is our top pick. However, it’s likely to be a niche choice. Where the Renault Scenic Estate struggles a bit is with pulling power. No engine has a significant amount so as to carry you on a full load with pace, which is why most buyers will settle for a frugal diesel. There is the option of what’s come to be known as a “mild hybrid.” In other words, it’s a hybrid with an electric motor that only does a bit of grafting during acceleration and at low speeds. Most of the time, it’s the diesel that’s putting a shift in. Its USP is that Renault claims it’s at least 10% cleaner than the normal diesels. The exterior will grab all the attention in the showroom. Inside? The Scenic Estate is less showy. It was Renault’s aim to make a smooth, comfortable family car, and they’ve succeeded for the most part. However, it was a car designed with French roads in mind – rather than broken and bruised British ones. Something to think about. Moreover, the car only comes with those hefty 20” alloys. No smaller option is available, although Renault has been at pains to assure buyers that the suspension has been primed for these wheels and that the taller sides of the tyres mean that ride quality will be good. Refinement isn’t up for debate – it’s excellent, and very little noise gets into the cabin. In terms of the interior design, the dashboard is much more restrained than the car’s exterior styling. There are plenty of dark plastics, but the sombre mood is lifted somewhat by the large windscreen. All models come with a touchscreen, but the entry-level models have to settle for a fairly small one with limited functionality. Overall, fit and finish and build quality is good, as is practicality. There is more space than last time, especially up front. Despite this, though, leg and headroom in the rear feel compromised. It’s a versatile interior; its rear seats can be slid back and forth, a 13-litre storage compartment that’s hidden in the centre console illuminates for ease-of-use, and USB ports seem to be everywhere. The car also comes with 4 under-floor storage areas. The boot, meanwhile, measures 572-litres with all the seats up. 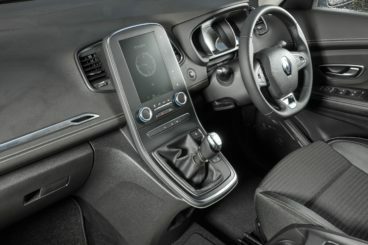 Standard kit is good across the range, with all models getting an infotainment screen, dual-zone climate control, a leather steering, a DAB radio, and Bluetooth. The Dynamique Nav gets airplane-style tables, more USB ports, keyless go, and front and rear parking sensors. It also gets the brands R-Link multimedia system, which is a step-up from the smaller infotainment screen. Dynamique S Nav adds a panoramic sunroof, an 8.7” portrait touchscreen, as well as the first ever colour head-up display in a car of this type. The Signature Nav trim rounds things off with a massage function for the front seats, black leather upholstery and full LED headlights. The Renault Scenic Estate is a safe car, and was awarded all five stars when crash-tested by Euro NCAP. It gets all kind of advanced safety tech onboard, including lane-departure assistance, lane-departure warning and active emergency braking. Prices for the new car start out from £21,600 and rise to £30,800. If you prefer to lease, you can pick up a deal from £261 + VAT per month. For more information on our leasing deals, check out our page here. In terms of its running costs, the mild hybrid means that the Renault Scenic Estate can return as much as 80.7mpg. The conventional DCI 110 diesel, meanwhile, is also impressively frugal, and can return 72.4mpg economy if you stick with the manual transmission. The petrols are more on the expensive end of the spectrum, with both the 115 and 130 TCe models returning 48.7mpg. All models cost £140 a year to tax after the first year, for which how much you pay is based on emissions. Renault has really upped their game recently. All their recent models are visually appealing, and with its shapely body it’s ensuring that cars like this stay in demand. Indeed, Renault’s design boss went as far as saying that the only way to maintain sales for the Scenic was to make it more desirable. A “hidden” 13-litre storage area and rear seats that slide back and forth are just a part of what makes this car so useful. It’s not as fun as a Megane, but the driving experience is easygoing and pleasant. One of its biggest flaws is that rear seated passengers will be a bit cramped. Wind noise will be an issue, especially at speed. Let’s see how the car fares against its rivals in the comparison section of our 2017 Renault Scenic Estate review. The new Volkswagen Golf SV adds a taller roofline, which might make it a bit less attractive than the popular hatchback – but it also makes it much more practical. On the road, there isn’t that much difference between the conventional Golf and this one. It leans a bit more in bends, but the steering is still sharp and the ride quality is good. Moreover, the VW Golf SV is just as fun, thanks to responsive handling. You can even get yours with stiffer suspension and 17” alloys if you opt for the GT trim. That might seem odd for a family car, but it’s nice to have the choice! In terms of the engines, a 1.4-litre 84bhp petrol kicks things off. It’s the one we’d overlook, as it can’t cope as well as the others with a full load. A 123bhp variant puts a bit more meat on the bone, and can do 0-62 in less than 10.0 seconds. You can add a £1,415 DSG transmission for extra relaxation, but it isn’t as smooth as the standard automatic. For even more power, check out the 148bhp variant. However, high-mileage drivers will likely stick to the diesels. A 1.6-litre TDI 113bhp unit sits at the bottom of the range, and can do 0-62 in 11.0 seconds flat. It’s refined and smooth, but is liable to running out of puff on steeper hills. A 2.0-litre 148bhp TDI diesel rounds things off with a 0-62 time of 9.2 seconds. In terms of economy, the 1.6-litre diesel is the cheapest to run with its returns of 67.3mpg and emissions of just 110g/km of CO2. 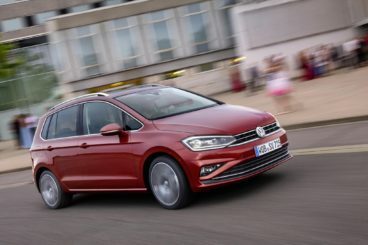 The bigger 2.0-litre 148bhp diesel is good for 65.7mpg, while the 1.4-litre petrol can return as much as 57mpg, making the Volkswagen Golf SV a respectably economical car. Inside, there aren’t too many hang-ups. It’s not a stylish car, with VW instead of creating a robust workhorse. That said, you do get some nice features, with the SE model coming with a multifunction steering wheel and a 6.5” touchscreen. The dash is pretty much the same as the one in the conventional Golf, which means it’s one of the best on the market. The biggest difference between the Volkswagen Golf SV and the regular Golf is this one is bigger and has more usability. It’s taller and wider, which means access is easier and there are more head and legroom for all. But while it looks impressive next to the regular Golf, it’s less versatile than a lot of MPV rivals. It’s not what you’d call a full-on people carrier. Still, if you slide the rear seats forward you can free up 590-litres of boot space. Fold them flat, and you can extend that to 1,512-litres. 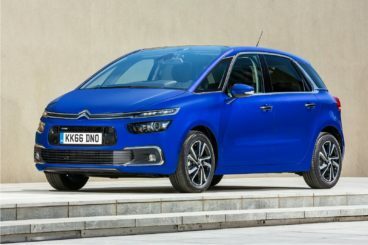 The new Citroen C4 Picasso is a sharp-looking, affordable MPV that’s got pretty much everything a family is looking for. It might not be much fun, but it’s super comfortable. Body lean is excessive and its handling isn’t all that sharp, but we reckon most buyers will take this trade-off against a cosseted ride. The engine range kicks off with a BlueHDi 100 diesel that produces 99bhp and can get you from rest to 62mph in 12.7 seconds. It actually feels quite sprightly, even on a full load. However, a BlueHDi 120 diesel has more appeal. It develops up to 118bhp, and covers the 0-62 dash in 11.3 seconds. Both models are quiet and reasonably economical. There aren’t many to choose from if you want a petrol engine. In fact, only a 1.2-litre engine is available, but you can get it in two separate power guises. The 128bhp variant is the quickest in the range, and can do 0-62 in just 10.1 seconds. A 108bhp variant is considerably slower, and is only available with the base-level model. In terms of running costs, the Blue HDi diesel is the cheapest, and can return 74.3mpg no matter which variant you go for. The 1.2-litre petrols, meanwhile, return 56.5mpg at best. Inside, the Citroen C4 Picasso is comfortable and quiet. Happily, its futuristic exterior design is mirrored by an equally forward-thinking interior design. Fit and finish is perhaps not as good as rivals, but build quality is good, and the car should be able to cope with the demands of family life on the road. There are a few polarising touches. The centrally-mounted digital instrument console won’t be to everyone’s liking, while the 12” colour display in higher-spec models may seem a bit of a gimmick. Still, there can be no denying that this is a practical car. A small glovebox aside, an electric parking brake is useful, as are three individual rear seats. The boot measures 537-litres which extends to 1,851 when all seats are folded, while head and legroom are excellent. The new Scenic is the latest example of Renault’s uncanny ability to produce usable but desirable family cars. It gets 10/10 for styling, while its clever storage areas and versatility ensure it scores nearly the same for practicality. If you want to feel confident, stylish and safe on the road, the new Renault Scenic Estate is an excellent choice.